This unrepresentativeness is something that we should all be concerned by. First, the current lack of diversity within the political class means that we might be missing out on original thinking and new ideas that could help to solve policy problems that have dominated British politics for decades. Second, it violates the principle of political equality on which our democratic system of government is based. To put it another way, the fact that certain groups of society appear to be systematically excluded from holding positions of political power calls into question whether British democracy truly lives up to its name? To learn more about exactly who is in the political class and, as important, who is not, take this quiz. Featured image credit: hierarchy-human-man-woman by geralt. CC0 via Pixabay. Peter Allen is Reader in Comparative Politics at the University of Bath. His research on representation, political behaviour, and gender and politics has been published in a number of academic journals. He is currently an ESRC Future Research Leader and a 2016-7 Kluge Fellow at the Library of Congress in Washington D.C. 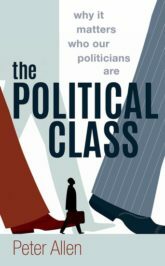 The Political Class: Why It Matters Who Our Politicians Are is his first book.